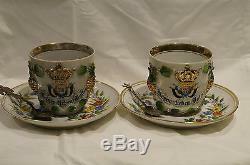 This is a used condition WW1 Imperial German Coffee/Tea China Cup and Saucer Set. 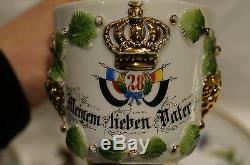 The china set is dated 1913 and commemorates Prussian General von Goeben's 2nd Infantry of the Rhein, 28th of the Prussian Army. 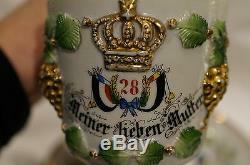 There is a Mother and Father cup and saucer. 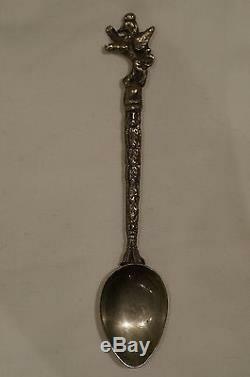 Also includes 2 patriotic spoons: one Great War Victory 1914-18 and one Rheinland Griffin. The set is in excellent condition, no chips/visible hairline cracks, but the gild around the lip of the Mother's cup and saucer shows wear (from normal use), while the Father's cup and saucer shows only little wear. 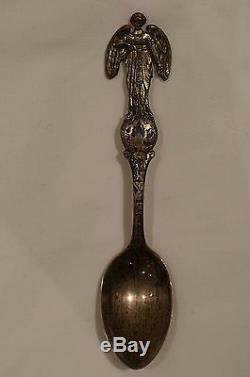 The Great War spoon shows a bit of wear on the handle (again from normal use) but the Rheinland spoon shows little wear. GST of 5% is applicable on all sales within Canada. 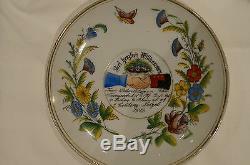 The item "WW1 Imperial German von Goeben Infantry 2 Rhein. 28 Coffee/Tea China Cup Set" is in sale since Saturday, January 16, 2016. 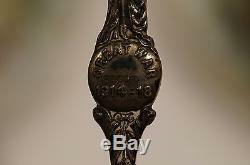 This item is in the category "Collectibles\Militaria\WW I (1914-18)\Original Period Items\Germany\Other German WWI Orig. 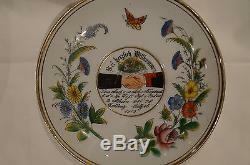 The seller is "military*antiques*toronto" and is located in North York, Ontario. This item can be shipped to United States, all countries in Europe, all countries in continental Asia, Canada, Mexico, Brazil, Australia.